Nov. 23, 2017 6:00 a.m.
It’s beginning to smell a lot like Christmas — at Tigh-Na-Mara, at least. 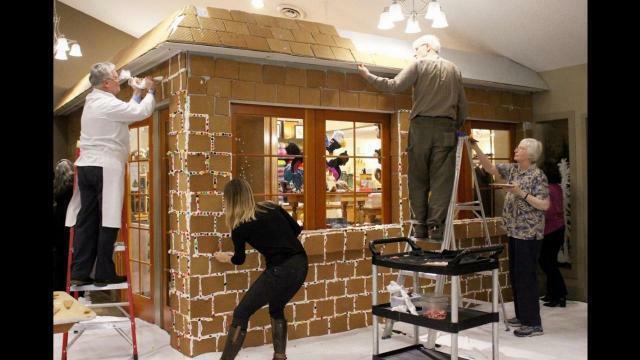 Tigh-Na-Mara Seaside Spa Resort and Conference Centre workers, along with Santa’s little helpers, converted the outside of the gift shop into a life-sized gingerbread house this week. Eric Edwards, executive chef at Tig-Na-Mara, said since the resort doesn’t have a huge bakery, they outsourced the gingerbread to a company in Victoria. Edwards said the resort purchased 1,000 sheets of gingerbread. “It was hundreds and hundreds and hundreds of pounds,” Edwards said. They also purchased 200 to 300 pounds of icing and about 100 pounds of candy. Edwards said they do have to stop guests from eating the candy from time to time. Asked if it was little kids sneaking the candy, Edwards laughed and said it was usually adults. “It’s the kid in all of us who go to it. Everybody loves gingerbread. Everybody loves candy,” he said. The gingerbread house is set up in time for the Tigh-Na-Mara Toy Drive which takes place Wednesday, Nov. 29 6:30-10 a.m.